Montreal, Canada – Fans of the Fast and the Furious film franchise will be in for a treat as Eurokracy teases a 15-second clip ahead of the latest installment, Furious 7, this upcoming April 3, 2015. Appearing at select Cinémas Guzzo theatres across the Greater Montreal Area, this short trailer teases many of the new attractions and competitions available at Eurokracy 2015. 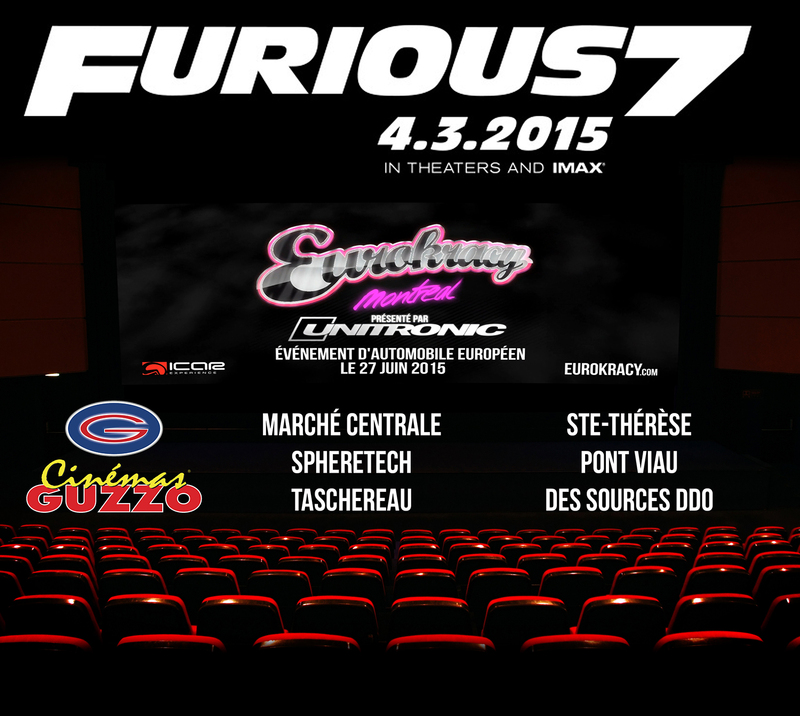 The Eurokracy 2015 teaser trailer will play to audiences at the following Cinémas Guzzo locations: Marché Centrale, Spheretech, Taschereau, Ste-Thérèse, Pont Viau, Des Sources DDO. Furious 7 opens to general audiences on Friday, April 3, 2015 nationwide. This action film chronicles a band of outlaws’ quest for revenge against a brutal murderer, and is packed full of modified cars and automotive stunts. Eurokracy Montréal is Canada’s largest European automotive event, and is presented by Unitronic. Eurokracy attracts spectators from all over North America to a one-day event held on June 27, 2015 at ICAR Experience in Mirabel, Québec.